Take your game to the next level with Operation Overlord and relive the battles of WWII on a grand scale. With up to 4 players per side, you will soon experience the highs and lows of being part of a military-style chain of command. 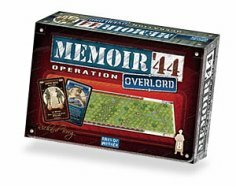 Combined with an original copy of Memoir '44, this expansion includes all the material required to play Overlord games. Scenarios are not included; this expansion is designed to be played with our Memoir '44 Battle Map series of Overlord maps. This is another expansion for Memoir '44, but of a very different nature than the ones that introduce new theaters of operation. This expansion is specifically for those who wish to play with more players (up to 4 on each side) and play longer more involved scenarios. I highly recommend this expansion to those who want a longer and more strategic way to play Memoir '44.